DARIEN — Collages, acrylics, monoprints and miniature canvases and easels decorated the walls of the Darien Nature Center for the opening of the Small Tidings exhibit. A group of 12 local artists, known as the Concepts Group, reunited on Nov. 16 to demonstrate their varied and unique art styles. Though each individual artist expresses her work via different mediums, they all share the common experience of learning under the same teacher: Constance Kiermaier. 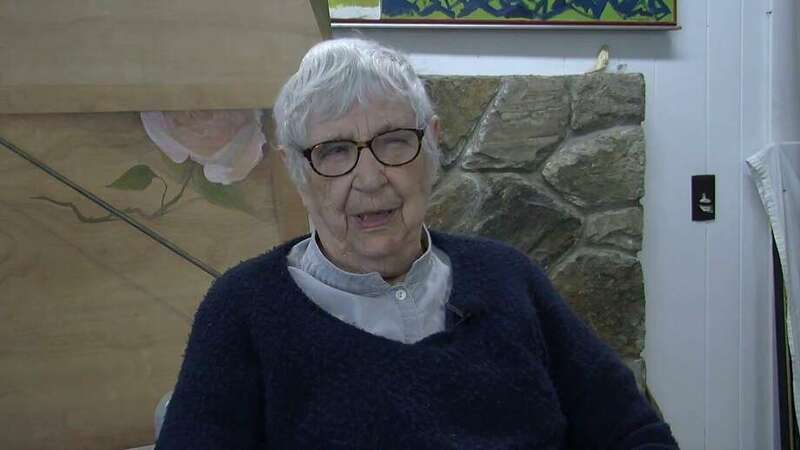 Kiermaier, who taught an art class for 25 years at the Darien Arts Center, lived in Westport for 60 years before moving to Maine to be with her family a couple of years ago. At 90, she continues to mentor her group of students. Mary Manning was one of the select students in Kiermaier’s original class, the first of many in her 25-yearlong teaching track. “Constance always kept the class to a size of 12 students,” Manning said. “Every class we would have a homework assignment, and the purpose was to paint an idea, a concept. “I met Constance when I was a director of classes at the Darien Arts Center. She’s 90 years old, and she’s still my best friend,” Manning said. Jane Lubin, whose style centers on acrylics and collages on wood, met Kiermaier when she moved to Darien eight years ago. Leila Wetmore, executive director of the Darien Nature Center, said an hour after the exhibit’s opening, eight paintings had been sold. “Those who buy paintings have the option to leave them here in the exhibit or take them home with them tonight,” Wetmore said. Thirty percent of the proceeds from sales will go toward the Nature Center. Kim Bealle, of Darien, bought one of Donna Collins’ paintings from a four-painting series. “I wanted all of them. I love the shape and the simplicity and the watercolor is beautiful. I might give it to my daughter for Christmas, but I might also keep it for myself,” Bealle said. The exhibit will be on display until Jan. 19; all works are available for purchase. Gallery hours are 9 a.m. to 4 p.m. Monday to Friday and 9 a.m. to 1 p.m. on Saturday.